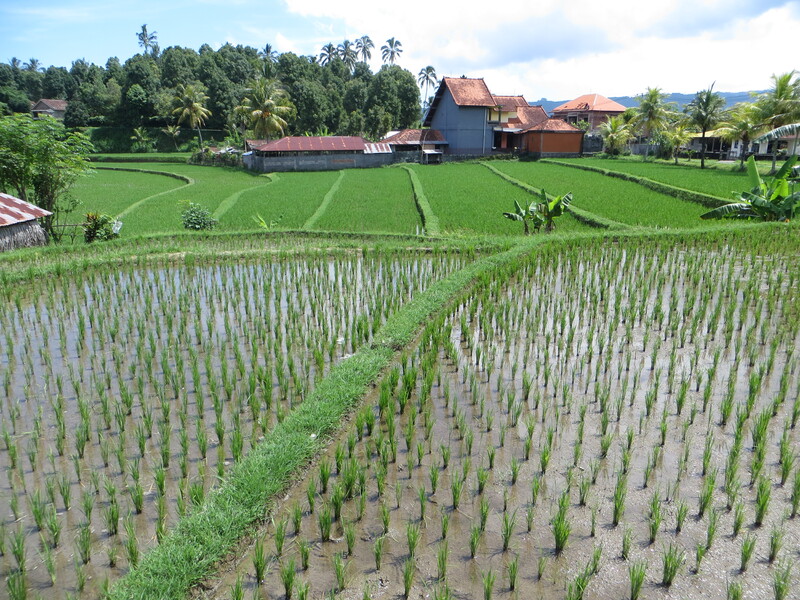 Our hotel is built in rice fields outside of Ubud; this picture was taken from our lunch table. As you can see, it’s not always sunny in paradise, which is probably related to how incredibly green much of the island is. 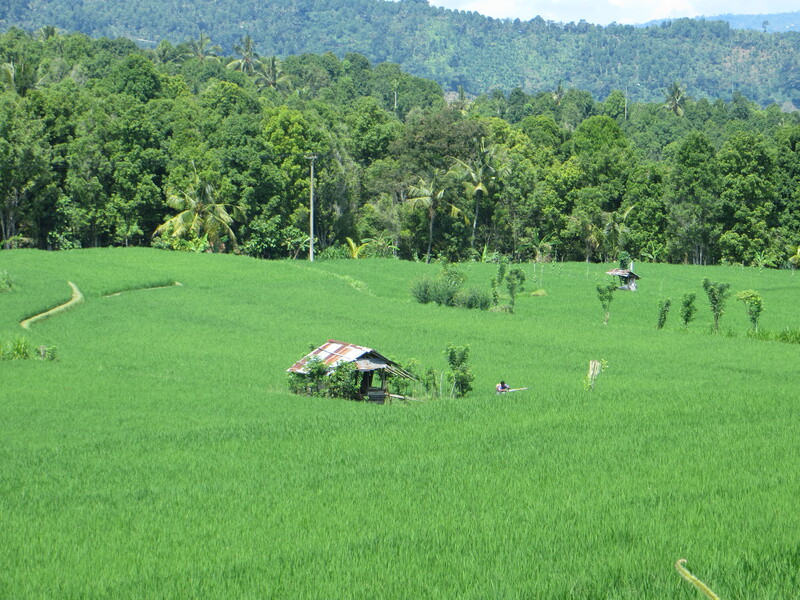 Note that while in other parts of Bali we’ve seen the rice is young and green, here it’s ripe and in fact being harvested while we’re here. 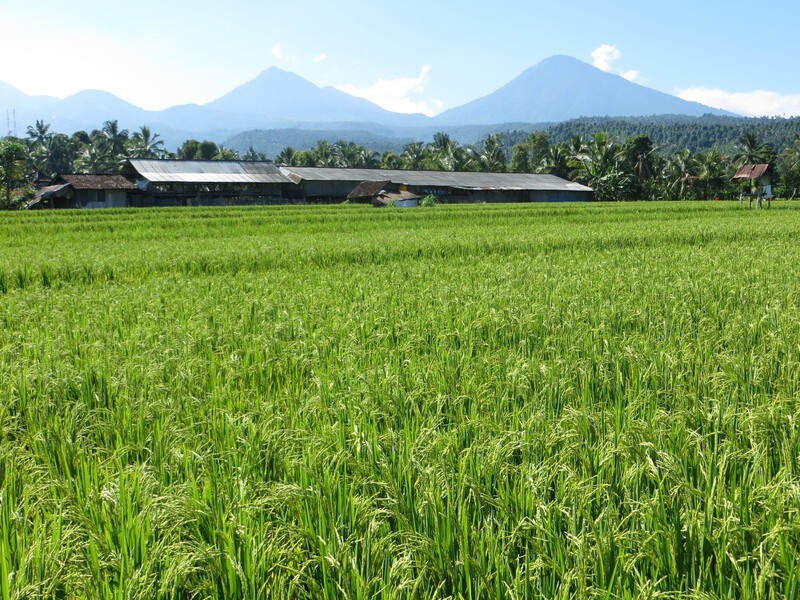 Yes, today is New Year’s Day here in Bali, the start of 1936 to be precise. Strangely, this is our fourth New Year celebration (Hmong, Western, Chinese, and now Balinese) since November. 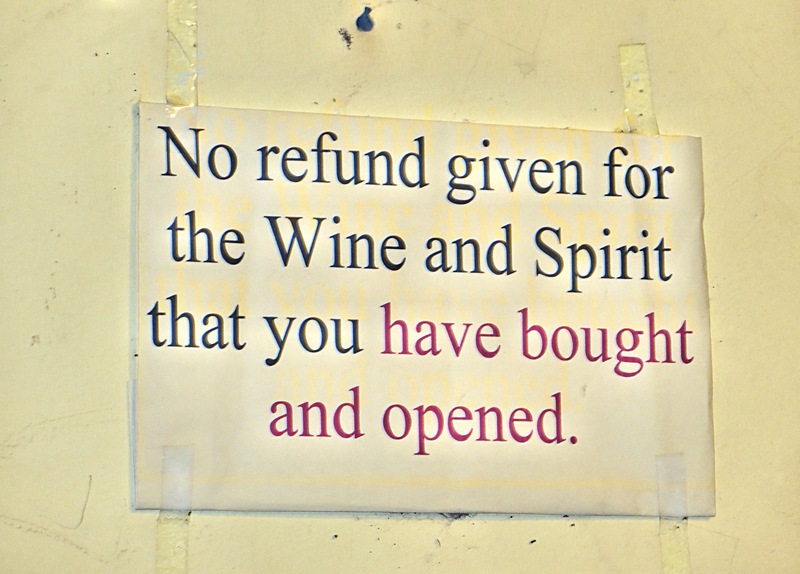 We stopped to buy wine and I was amused by this sign. Awfully picky, don’t you think? 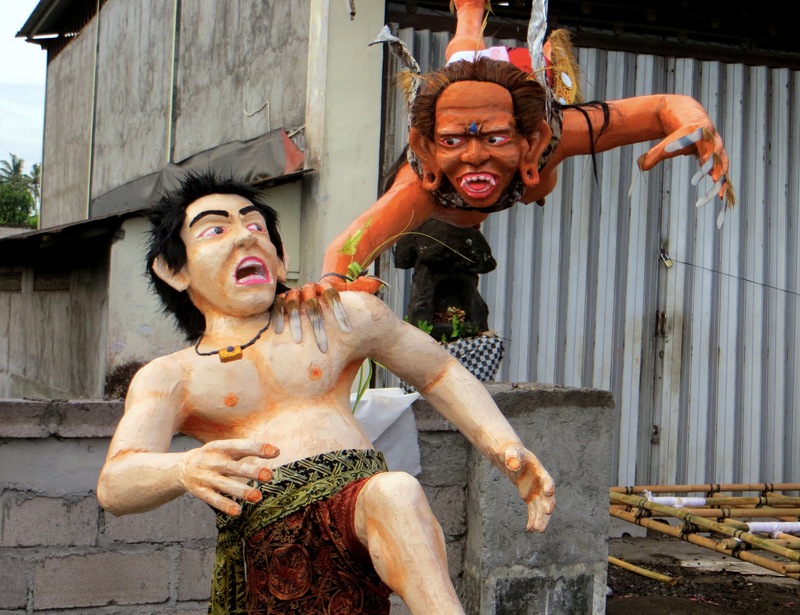 The Balinese New Year celebration – called Nyepi – is quite unlike anything we’ve experienced anywhere. The day itself is a day of “complete and utter inactivity and silence,” as the description in our hotel puts it. We are, in fact, banned from leaving the hotel. Seriously. Again, back to the instructions from the hotel: “No one (including foreigners and visitors to Bali) is allowed to go outside on Nyepi Day.” Apparently this has something to do with gods floating around today (or maybe evil spirits, I’m not entirely clear on my Nyepi cosmology) and if they see anyone not honoring the requirements of inactivity the whole village is in for a rotten year. There is even a traditional security force that enforces the rule, leaving exception only for emergency vehicles carrying people with genuinely life threatening conditions. Fortunately, though, “outside” seems to be defined as “outside the hotel compound,” since we are allowed to roam the grounds, go to the swimming pool, and so on. Still, it’s all pretty strange. The restaurant, for instance, closes at 6:00 PM; after that – and we don’t eat dinner before 6:00 PM – we can only get room service. Perhaps even more strange than the day of “complete and utter inactivity and silence” is the ogoh-ogoh parade the night before. Ogoh-ogoh are huge paper maché monster dolls, Hindu agents that are meant to purify nature from spiritual pollutants emitted by humans. As you can guess, they have quite a big job. And as you can see here, they are pretty scary. Finally, night comes and the parade begins. 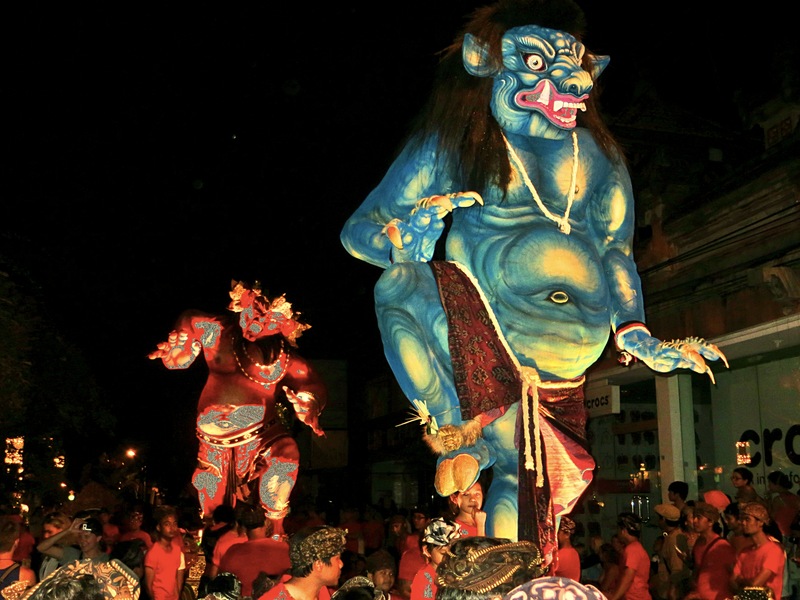 Here are two of the ogoh-ogoh being carried through the streets of Bali. Just a warning: this will be the most photo-intense blog ever. 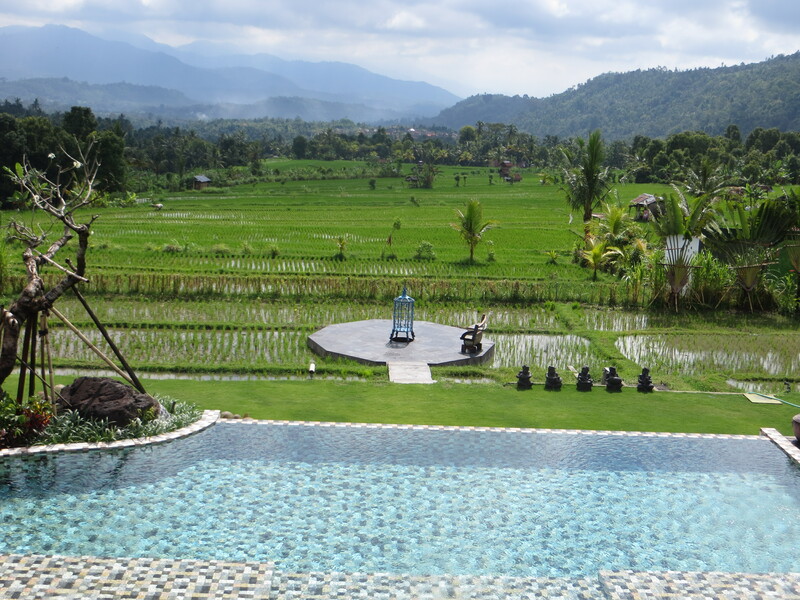 Something about Bali being just unbelievably, almost unspeakably beautiful. Everywhere you turn it’s just beautiful. So I’ve pared the photos back a lot, but there are still just a ton of gorgeous shots. 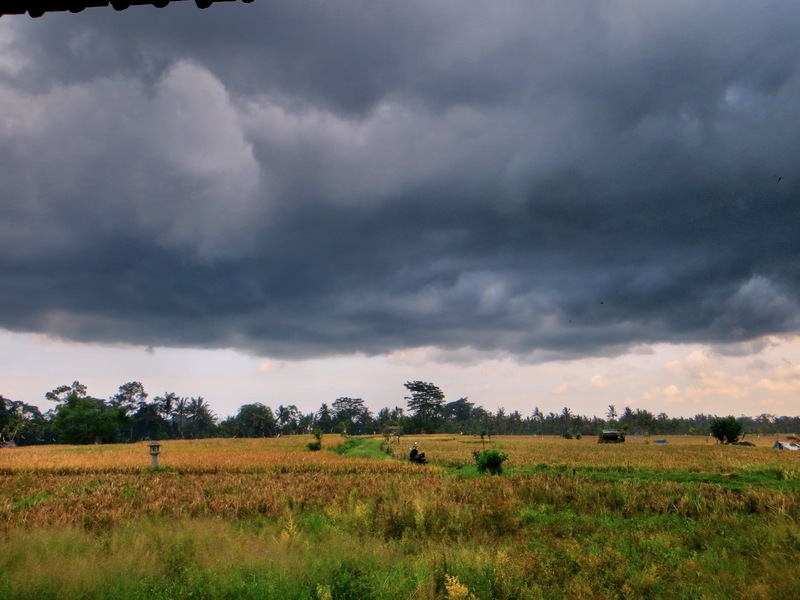 After leaving Flores we spent four days in Ubud, a city we visited in 1996, and the changes since then were, from my perspective, distinctly not for the better. 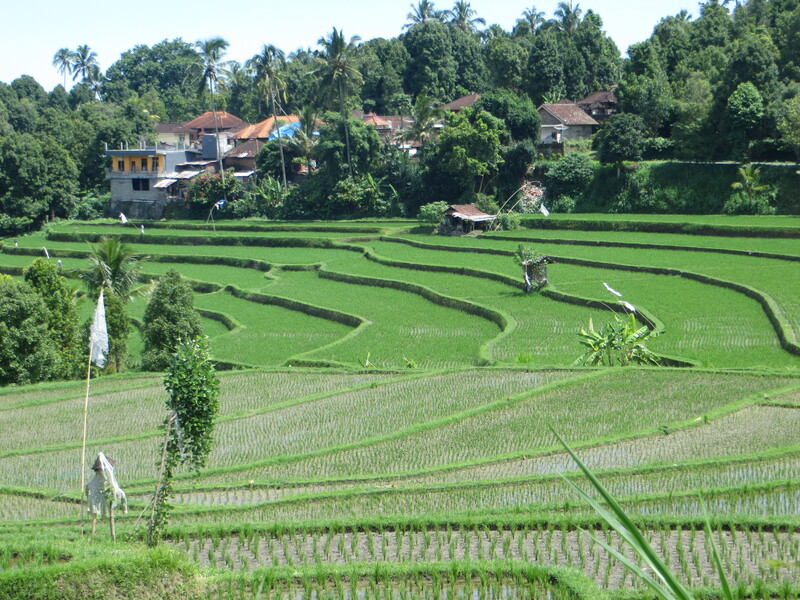 Ubud is now vastly bigger and the sense of village and the beauty of the rice fields are long gone. 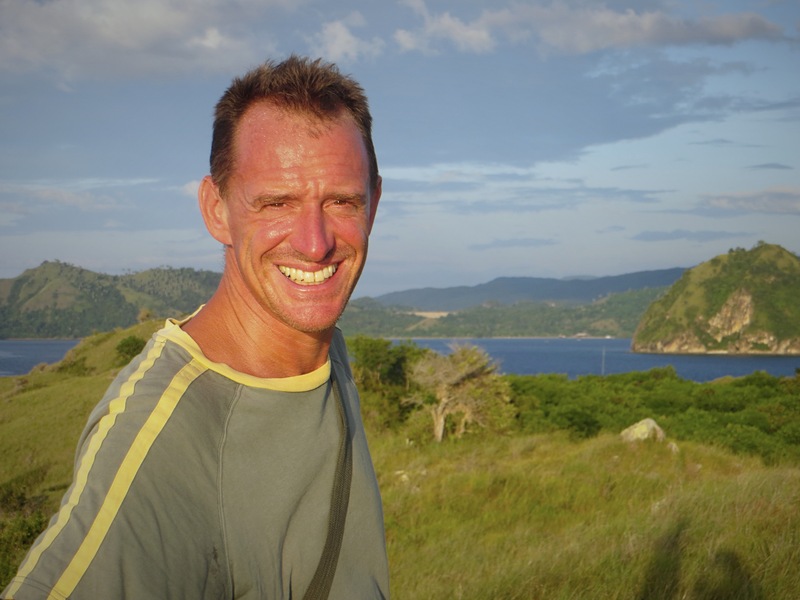 The good news was that my brother Al was on a business trip in Southeast Asia so he scheduled it so he could spend a weekend with us in Bali. And then on top of that an old friend from my days as a budget-and-tax advocate – she ran the group in California that was akin to my organization in Massachusetts – was on a Ford Foundation trip in the area, too. 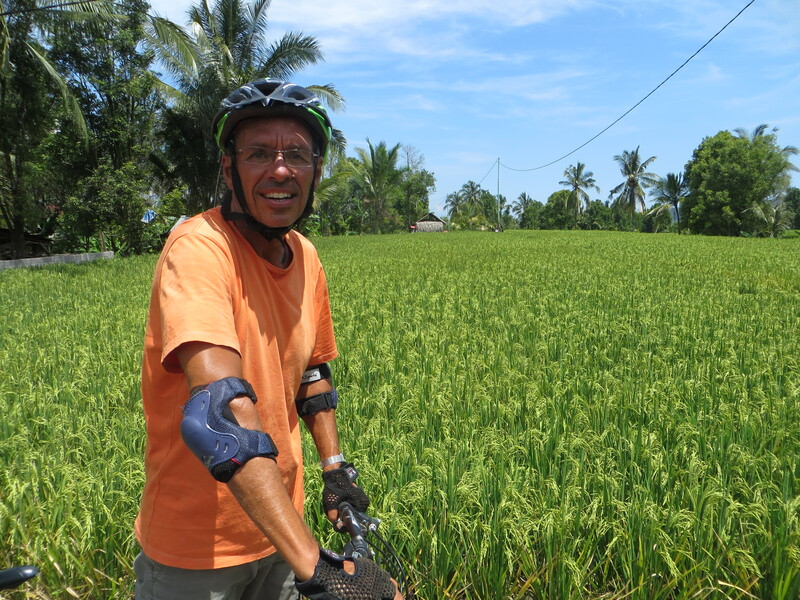 So while I wasn’t crazy about Ubud we had a great visit with them, including a bike ride mostly coasting downhill through rice fields. 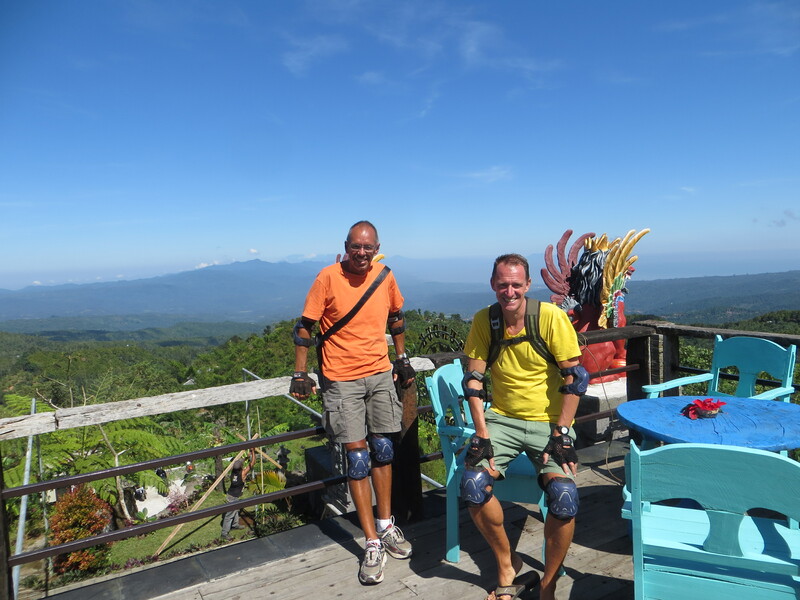 Once they were both headed back to work Mark & I headed north a couple hours to Munduk, a little place in north-central Bali. 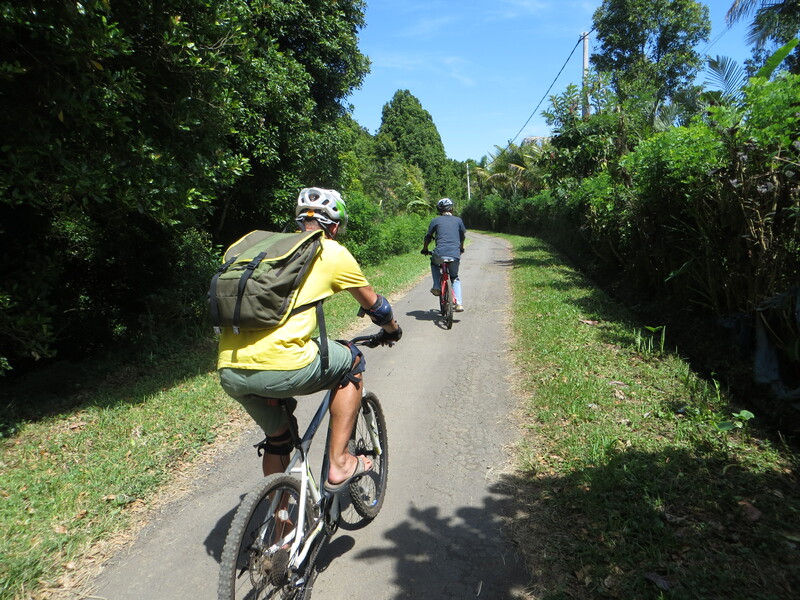 Well, it was supposed to be a couple hour drive; our driver got lost and took us on a bigger tour of north Bali than we’d expected adding an hour or two to our journey. The pool in late afternoon from our room. Not a bad view, but another window was over the valley below and even better. Once we got here, though, we found a slice of heaven, and not just a little slice either. Our resort, Sanak, is brand new, just opened two months ago, which is mostly a good thing. 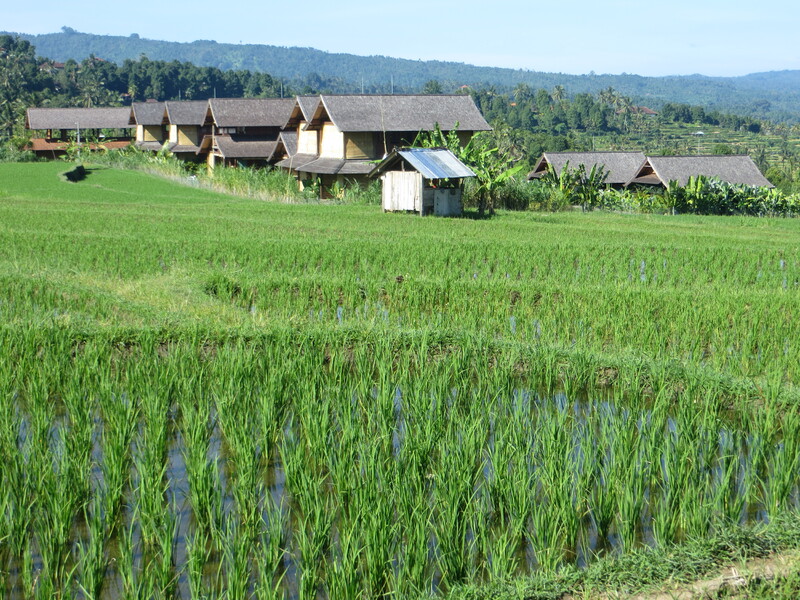 It’s set in a valley a little outside of the town, smack in the middle of beautiful rice fields. 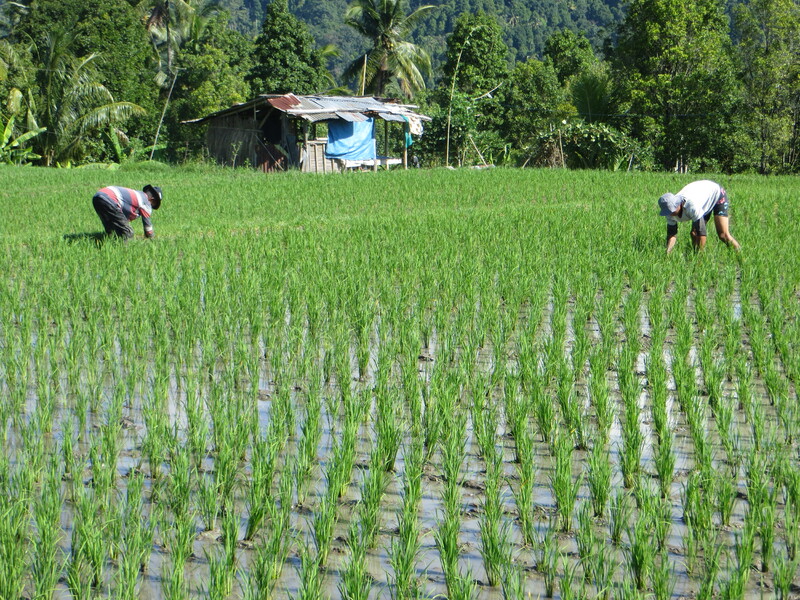 Most of the time the only thing you hear are the birds and the frogs and whatever animals live in rice fields; the night noises are really something. And water rushing. 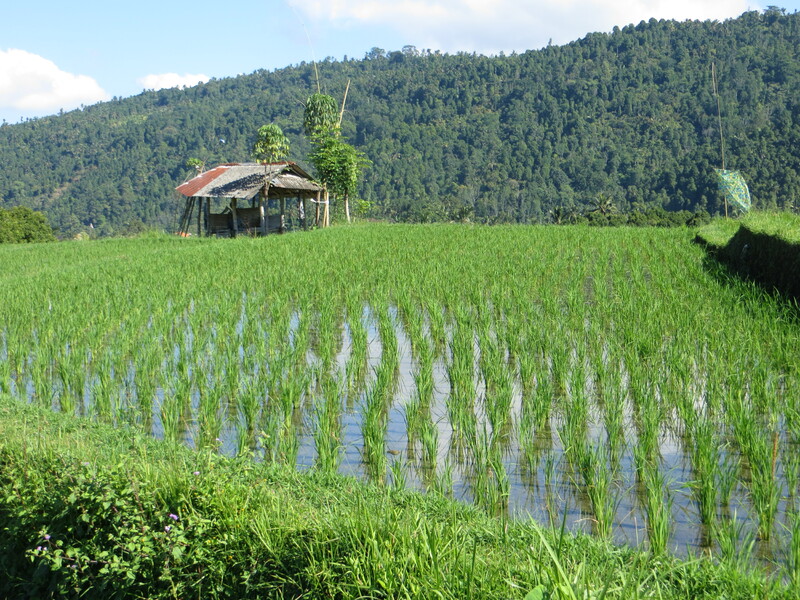 Rice fields require massive amounts of water and there is always the sound of irrigation running from one terraced field to another. 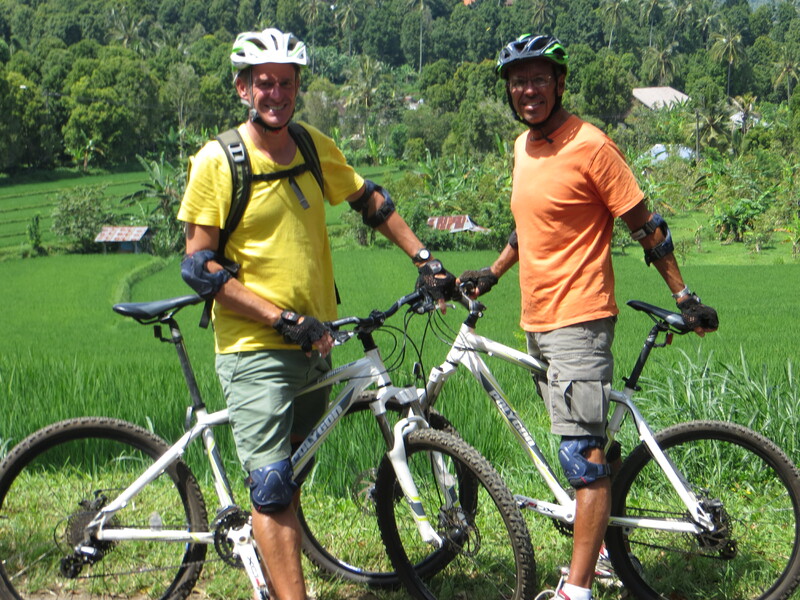 On our first full day we scheduled a bike trip that was described as both “downhill” and “challenging.” “How can that be?” we asked. The Balinese guy at the main office then proceeded to read the same description we were reading back to us; not very informative, to be honest. After a few more failed attempts to learn more about it we signed up without much of a sense of what we were in for; we figured the only way to find out was to try it. 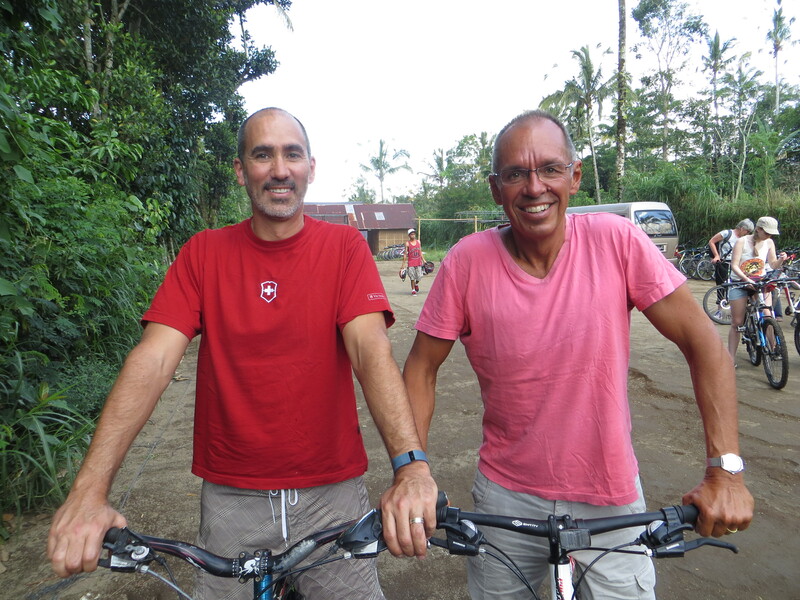 And while yes, it was downhill – the trip started with a 30- to 40-minute drive up the mountain before we got on our bikes – the first part of it was downhill on exceedingly rough roads and mountain trails. When the pavement eventually kicked in, there were eventually some uphill segments that were distinctly challenging. Here we are at the top of the mountain (or hill, or whatever it was) getting ready for the downhill. In the far distance you can see Java, or at least we could. 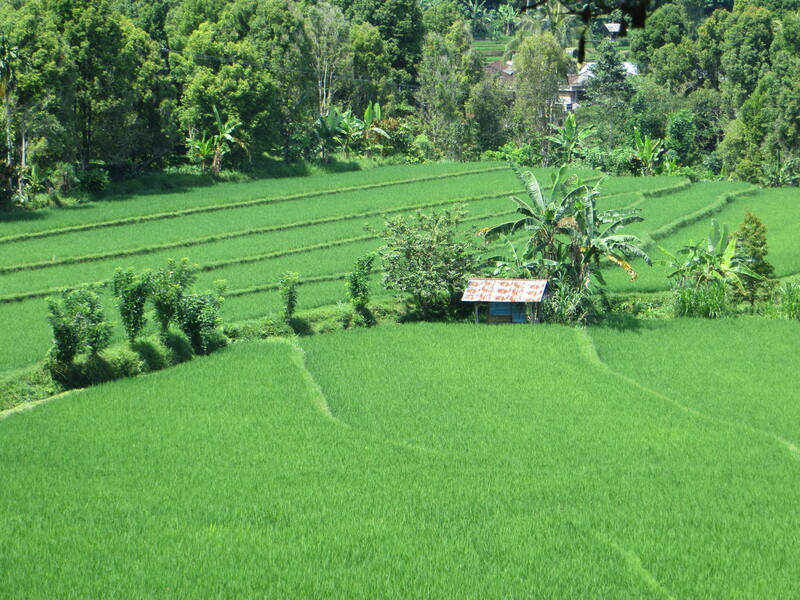 That was a beautiful way to see part of Bali. 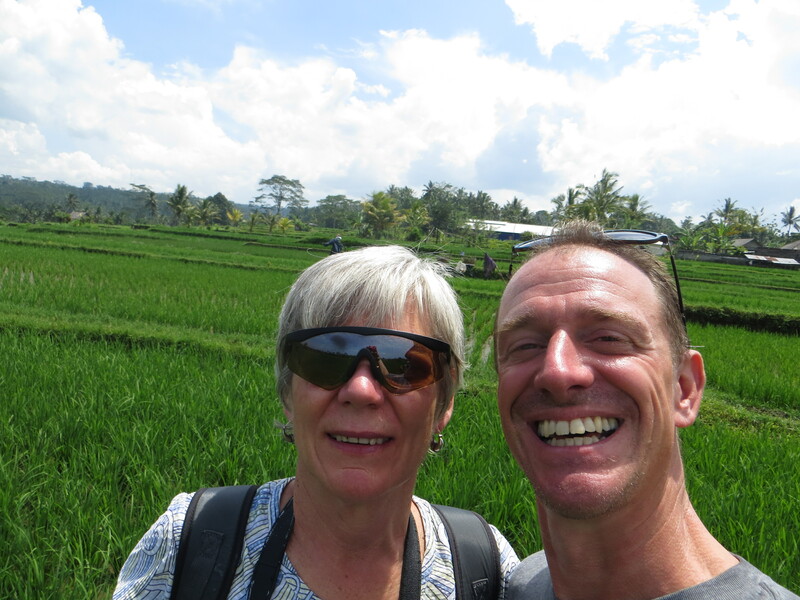 So the next day we decided to kick it down a notch, with just a hiking tour through the rice fields. This time no car was involved at all, just two local guys who came to our lodge and took us on a two- or three-hour hike on paths that we’d have never in a million years found on our own. 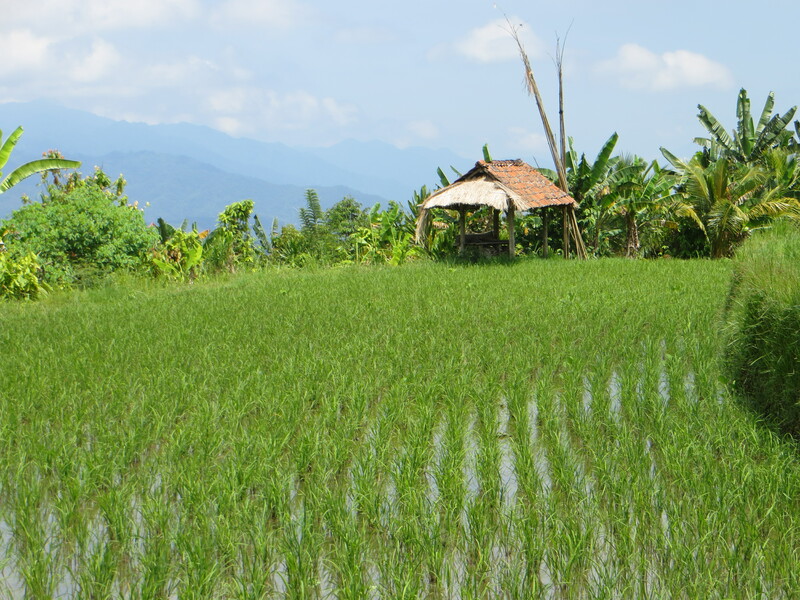 The destination was a big waterfall, but we didn’t honestly need a destination at all; this was a case where the journey, with all the views of rice fields, really was the destination. 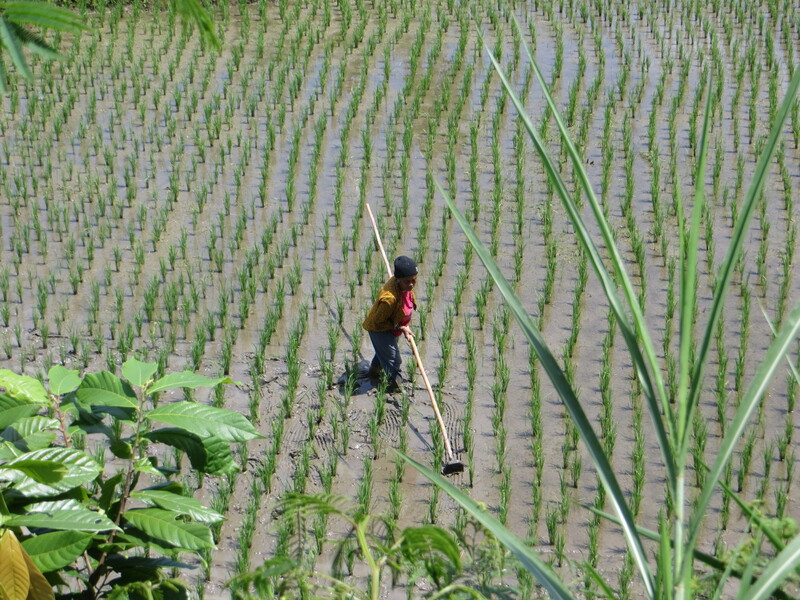 Did I warn you there’d be pictures of rice fields? 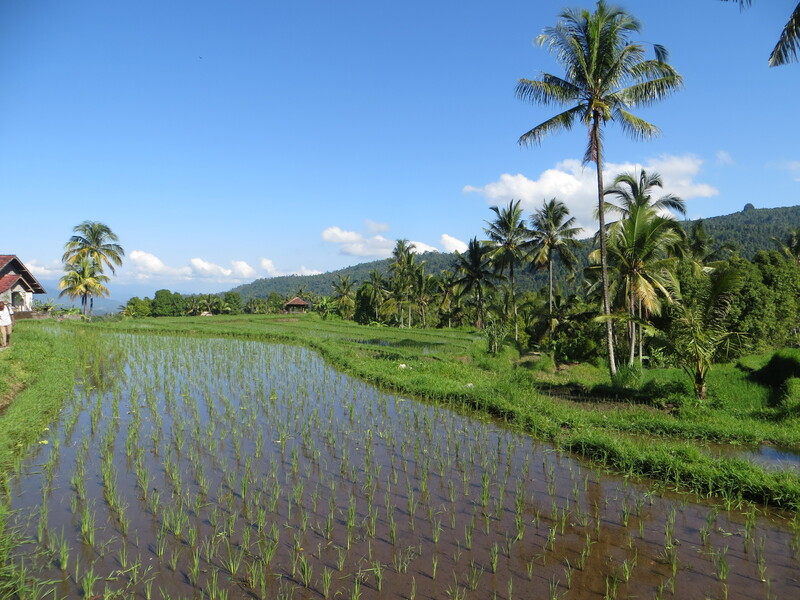 So after the hubbub of Ubud, which didn’t do a lot for me, we felt like we were in the real Bali, the quiet island where beauty reigns. So what do we do after this? 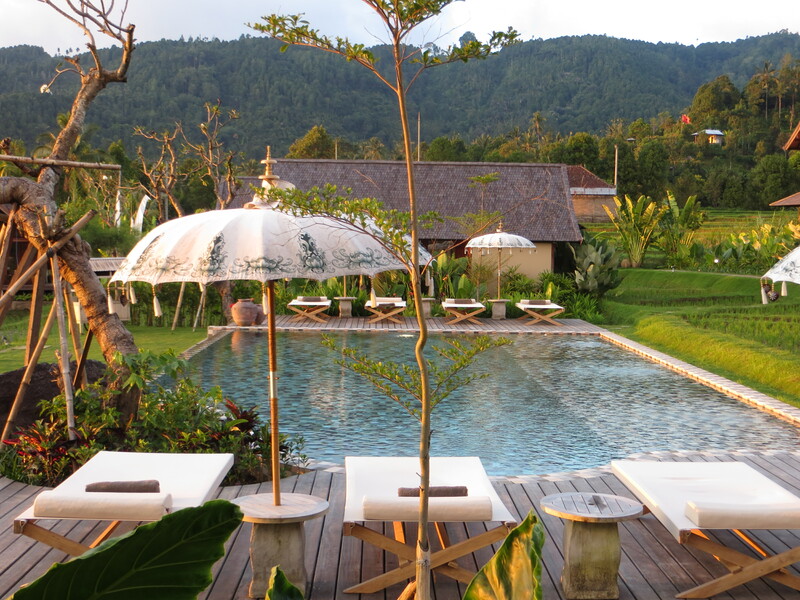 We’re going back to Ubud! We’d already made reservations, but this time we’re staying in a place out of town a bit, so it should be quieter and more relaxing. Stay tuned – more beauty on the way! 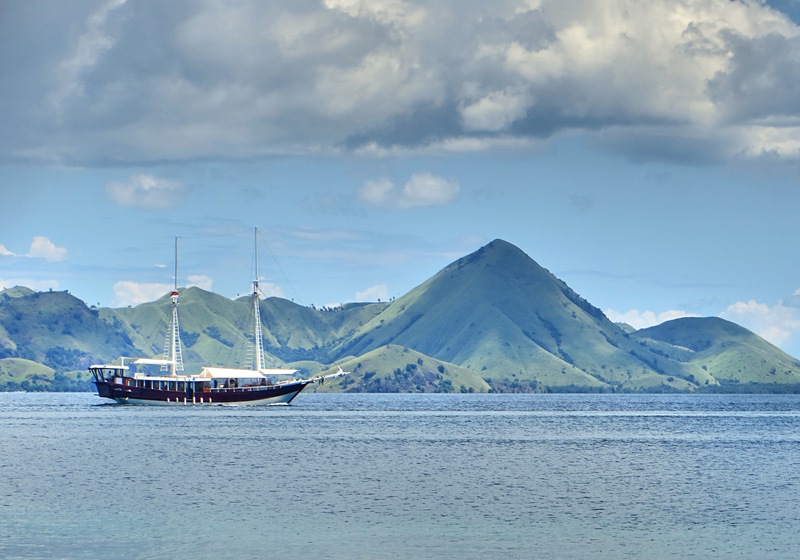 Not much to report here from our little island off Flores; this may be the laziest week I’ve ever spent. 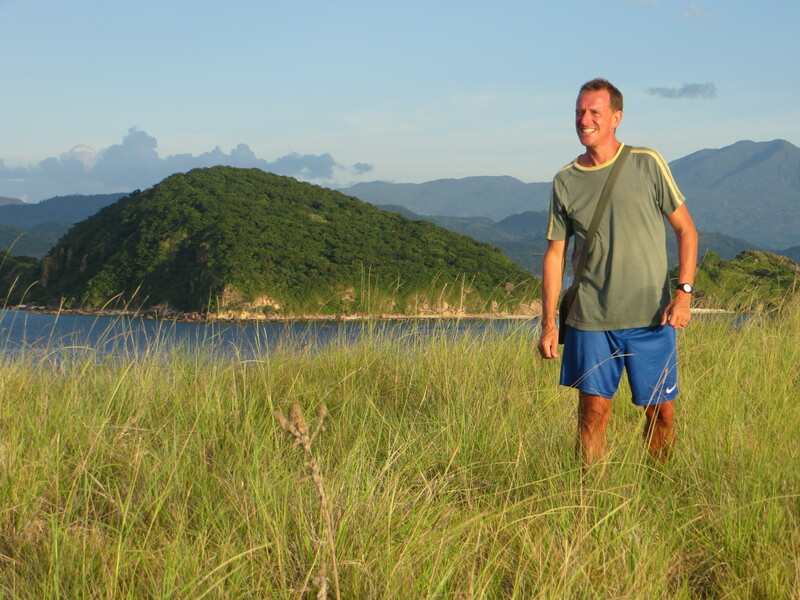 Except for our excursion to see the dragons on Rinca Island we just hung around the island. A little swimming, some snorkeling, a couple walks around the island, lots of reading, great meals … that’s all. One item worth noting was how great the food was here. On a little island with literally nothing besides our lodge, we had every meal for a week in the same restaurant and we never got tired of it. They had a huge menu and – this is what was so remarkable, with typically no more than 10 or 12 people for a meal – never ran out of anything. I don’t know how they could do it, but the food ranged from really good to really, really good. I wonder, though, if they have any tomatoes left; Mark and I both had fresh tomato salads every day with lunch. YUM! 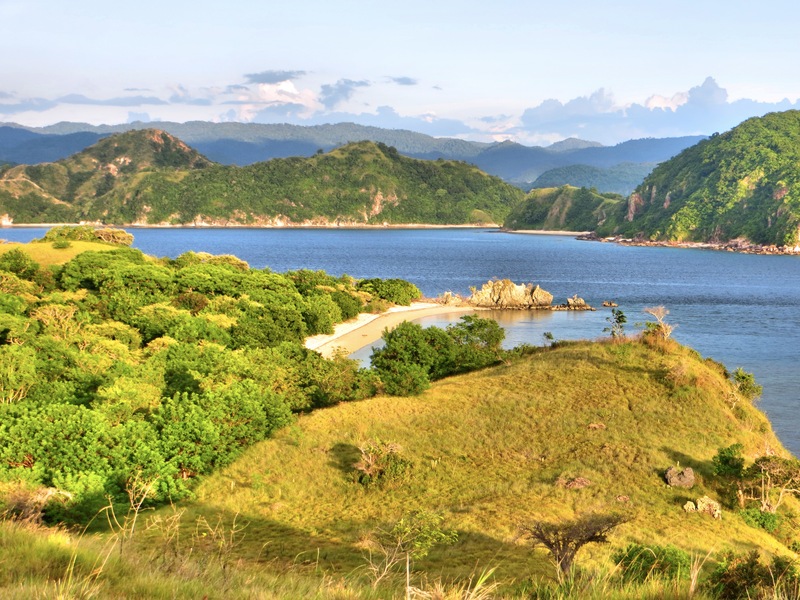 The view of the Flores Sea from our beach. The snorkeling right from the beach was really great, including a cute little baby shark that was often hanging around! 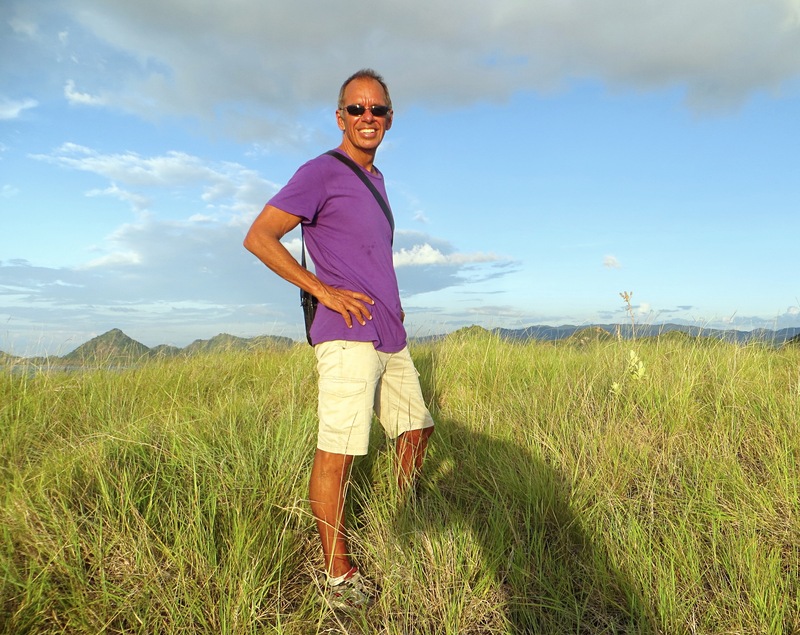 We took a little walk late one afternoon up to the highest point on the island. Too short, really, even to call it a hike, but the views and lighting were beautiful.